DEAD SHADOWS: Losing The Plot At The End Of The World – Schlockmania! It’s never been easier for the low-budget filmmaker to create the illusion of the world ending on a movie screen. With the advent of affordable digital cameras and CGI effects, any clever filmmaker can whip up an apocalypse on a budget. However, the real trick remains coming up with a novel story that can prop up all that digital trickery. Dead Shadows is a recent cost-conscious cataclysm film and it suggests that finding that good story is as challenging as the effects themselves. The hero of Dead Shadows is Chris (Fabian Wolfrom), a young man haunted by the death of his parents. When he was a child, they died under violent, possibly supernatural circumstances during a comet. Thus, he’s pretty nervous when a new comet is about to visit Earth. He prepares to hole up in his low-rent apartment but is tempted out by Claire (Blandine Marmigere), the pretty artist who lives down the hall. He travels out to join her at a “comet party” but fate intervenes when the comet’s passage affects the people around him, turning many insane and mutating some into alien-infected new shapes. With the help of tough guy neighbor John (John Fallon), Chris is forced to take up arms and try to save his would-be lady love as the comet-infected attackers grows more numerous and mutated. 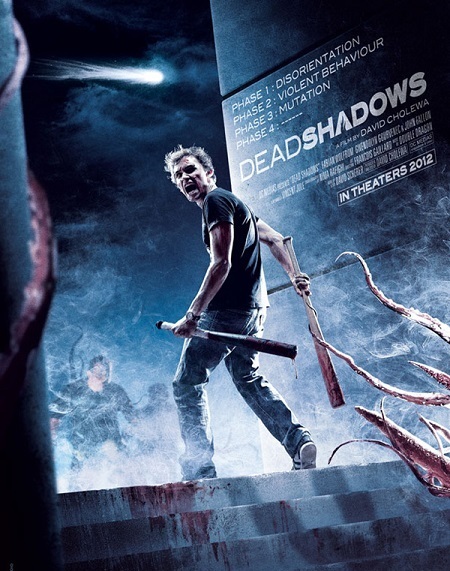 The problems with Dead Shadows don’t lie in the premise: it’s solid, if rather derivative of films like Night Of The Comet, the John Carpenter version of The Thing and George Romero’s Dead films. First-timer David Cholewa’s direction is technically proficient, with slickly-crafted CGI effects and an aggressive pace. The cast also seems competent enough, particularly Marmigere (who isn’t given enough to do). However, Dead Shadows suffers from a very serious malady: it never figures out how to make its plot elements add up into a meaningful, compelling yarn. Vincent Jule’s script is built on stock characterizations (the manic pixie dream-girl, the sullen tough guy, generic urban criminals, etc.) and is more interested in springing a series of effects setpieces on the audience than crafting a sturdy plotline. Even worse, it bites off more than it can chew in conceptual terms. It never explains what happened to Chris’s parents or how and why the comet is affecting people. Characters and plot twists are introduced, only to be abruptly dropped within minutes. The finale goes completely haywire, allowing the spectacle to overwhelm narrative coherence and the payoff of any plot elements. The fact that the hero is totally passive until the last 15 minutes doesn’t help things. As a result, Dead Shadows occupies its own corridor of unsatistfying sci-fi/horror hybrids, being too derivative to score points for its ideas and too disjointed to succeed as a competent potboiler. It’s a shame, particularly given the serviceable style and effects, but this film is more likely to frustrate genre fans than charm them with its helter-skelter approach to familiar elements.